A coaching blog from BeingLive.com, with life and business success tips to enjoy the present while working for a better tomorrow. Learn how to follow your passion, work smarter, manage time well, unleash creativity, use full potential, take advantage of new technologies, achieve goals and have fun along the way! Reminds us of the importance of the balance between the time for work and the time for self, family and friends. 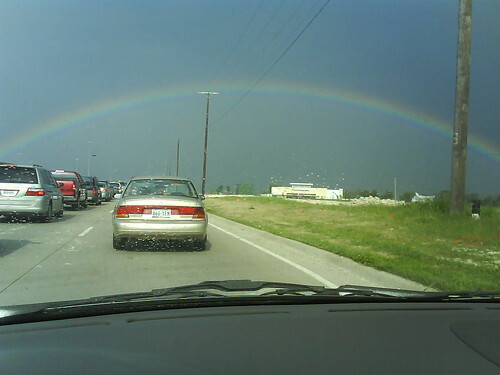 Rainbow in Dallas, originally uploaded by vin.bhat. “The work will wait while you show the child the rainbow, but the rainbow won't wait while you do the work.” -- Anonymous. This is so true for so many important things in life. We have to make time or else we will miss them for ever. The Celebrity Apprentice finalist Trace Adkins had a top song that just conveys the same thing head on. "You're Gonna Miss This"
How do you balance your work, life and play? Please comment.